Uber and Lyft also replace ownership with access for the companies themselves. Drivers provide their own cars, earning additional income from a resource they have already paid for that is often idle, or allowing them to help pay for a resource that they are then able to use in other parts of their lives. Meanwhile, Uber and Lyft avoid the capital expense of owning their own fleets of cars. A Platform, Not Just a Company. A traditional business that wants to grow must hire people, invest in plants and equipment, and build out a management hierarchy. Instead, Uber and Lyft have created digital platforms to manage and deploy hundreds of thousands of independent drivers, trusting the marketplace itself to ensure that enough of them show up to work and bring their own equipment with them. (Imagine for a moment that Walmart or McDonald’s didn’t schedule their workers, but simply offered work, trusted enough people to show up, and offered higher wages when there weren’t enough workers to meet demand.) This is a radically different kind of corporate organization. There are those who argue that Uber and Lyft are simply trying to avoid paying benefits by keeping their workers as independent contractors rather than as employees. It isn’t that simple. Yes, it does save them money, but independent-contractor status is also important to the scalability and flexibility of the model. Unlike taxis, which must be on the road full-time to earn enough to cover the driver’s daily rental fee, the Uber and Lyft model allows many more drivers to work part-time (and to take passenger requests simultaneously from both services), leading to an ebb and flow of supply that more naturally matches demand. More drivers means better availability for customers, shorter wait times, and far better geographic coverage. These companies are able to provide a five-minute response time over a far larger geographical area than traditional taxi and limousine companies. 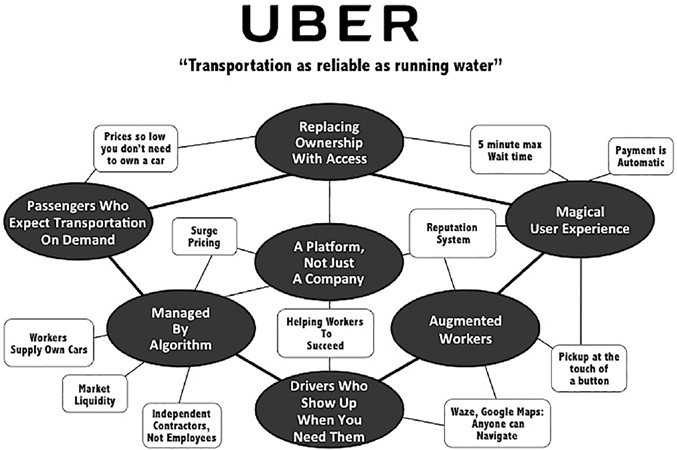 Management by Algorithm is central to Uber and Lyft’s business. It would be impossible to marshal the workers, connect drivers and passengers in real time, automatically track and bill every ride, or provide quality control by letting the passengers rate their drivers, without the use of powerful computer algorithms. Creating and deploying these algorithms is the core of what the company does. Every passenger is required to rate their driver after each trip; drivers also rate passengers. Drivers whose ratings fall below a certain level are dropped from the service. This can be a brutal management regime, but as political scientist Margaret Levi noted to me, from the point of view of passengers, the real-time reputation system acts as a kind of “private regulation” that outperforms traditional municipal taxi regulation in enforcing high standards of safety and customer experience.